VÖGELE pavers and screeds will be split into two lines and five classes moving forward. 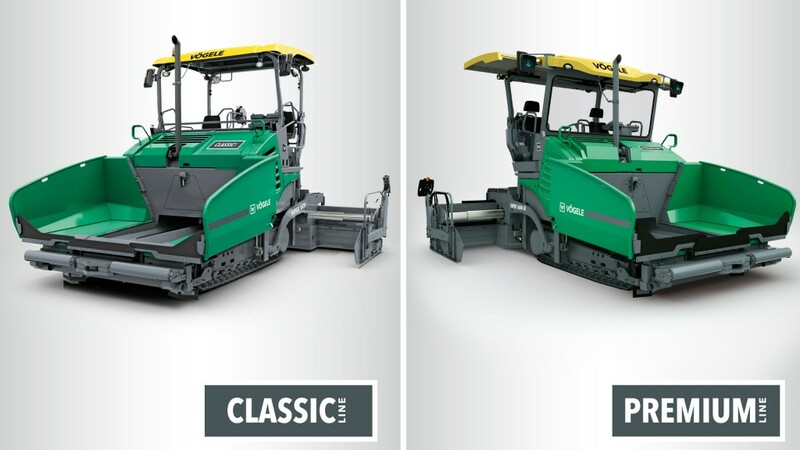 The newly introduced Classic Line is for pavers equipped with the extremely easy-to-use ErgoBasic operating concept. These machines are hallmarked by a very solid machine concept which offers a basic range of convenient features. But these machines offer all the essential features required for daily paving work. All the machines are equipped with engines and screeds that match the national requirements of their respective target markets. VÖGELE are combining all pavers featuring cutting-edge technology and advanced mechanical engineering in their Premium Line. Premium Line products are all equipped with the ErgoPlus 3 operating concept. This system is also quick to grasp but offers a number of additional features not included in ErgoBasic. Many functions can be configured via a high-contrast display which can be operated intuitively. The display additionally provides the operator with extensive information. Information about the screed or the conveyors and augers can simply be called up and altered on request. The automatic programs of VÖGELE's AutoSet Plus are also operated via the display of the ErgoPlus 3 console. If a customer has opted to use the RoadScan temperature-measurement system, the paver operator can monitor the temperature of the asphalt being paved on the display. Customers who are additionally using the WITOS Paving process-management solution, can also receive real-time information on the construction project on the display of their Premium Line machines, greatly increasing paving quality. Comprising the automatic functions of AutoSet Plus, the PaveDock Assistant communication system and the VÖGELE EcoPlus low-emissions package, VÖGELE's Premium Line offers all the functionality of the latest "Dash 3" generation. VÖGELE's Premium and Classic Lines are further divided into up to five different classes: the Mini Class, Compact Class, Universal Class, Highway Class and Special Class. The current total of 48 machines and 26 screed versions offered by VÖGELE are allocated to one of the lines based on their operating concept and equipment as well as to one of the classes depending on their pave width, performance and areas of application. VÖGELE will be unveiling the latest machines in the Classic Line and the Premium Line at Bauma 2019, where they are set to make their world debut.